From its inception, Valley Nonprofit Resources has focused on helping Valley nonprofits access philanthropic resources, whether from foundations, corporations or individual donors (prior activities are summarized on the Community Voice page). The latest effort, co-hosted with Southern California Grantmakers, CSUN Foundation, Valley Presbyterian Hospital, and James Irvine Foundation Trustee Kafi Blumenfield (also CEO of the Valley’s Discovery Cube), was an April 29, 2016 brainstorming meeting to talk about ways in which the presence of philanthropy in the Valley can be increased. Follow-up activities are being planned. To learn more, see the report from this brainstorming meeting, Philanthropy Presence Meeting Summary (.pdf). 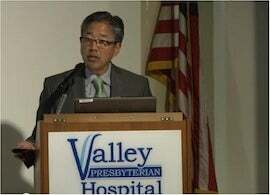 This section has brief information about and downloadable materials from a November 2012 conference (the photo above is of the California Community Foundation's John Kobara). The Hiding in Plain Sight - Engaging Philanthropy with San Fernando Valley Nonprofits conference was held on Wednesday, November 14, 2012 at Valley Presbyterian Hospital's Jean & David Fleming Health Education Center. This conference brought together nearly 100 leaders in philanthropy and the nonprofit sector for a day of information-sharing, networking and brainstorming. The conference was videotaped and all of its key sessions are available here, some of them in summary form. The first goal of the conference was to provide information and insights to philanthropists - foundations, corporations and individual donors - about the diverse needs of the San Fernando Valley and its nearly 2 million residents, and about the work being done by Valley nonprofits. The second goal was to brainstorm about how philanthropy for the Valley can be made more strategic in supporting the nonprofit sector here, and how both philanthropists and local nonprofits can communicate with and learn from each other more effectively. The conference program included hearing about the history of the San Fernando Valley, about the work philanthropy already is doing in the Valley, and about nonprofits and their important work to serve the needs of the Valley - arts and education, children and youth services, health and social services, and legal, environmental and housing services. It also included hearing about some remarkable research findings on the coming transfer of wealth in the Valley, and about what some local philanthropists already are doing to be more strategic in their giving. Over lunch, the conference group talked together about what next steps can be taken to improve communication and learning among philanthropy and nonprofits in the Valley. These suggestions are presented not in one of the videos here, but in a March 2013 Action Paper, which can be downloaded for further review. For more information, contact VNR. Preparation of the VPI Action Paper was supported by a grant from HersheyCause Communications. The Hiding in Plain Sight conference was supported by grants from The California Endowment, The California Wellness Foundation and Weingart Foundation.